This example illustrates how flexible COST/CompC++ is in handling variable-size arrays of outports or components. The sizes of these arrays are controlled by some simulation parameters that can only be determined during the runtime. As shown in the above picture, we will build a simulation consisting of several multiple M/M/1 systems running independently. It employs same Source, FIFO, and Sink as in the @M/M/1 simulation. Only the server is different. The server we are going to build for this example is a more powerful server called MultiServer that can be viewed as a composition of multiple servers that runs independently. It is capable of supporting any number of FIFO queues. 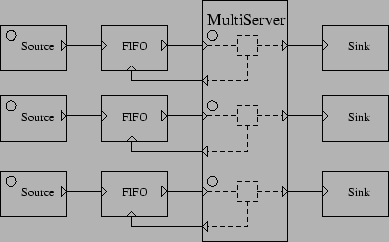 As a result, the Multiple M/M/1 system has the same number of sources, FIFO queues, and sinks, but only one super server. The number of sources, FIFO queues and sinks are configurable , i. e., this number can be exported as a simulation parameter which is to be assigned when the system is being instantiated. packet_t, Source, FIFO, and Sink are almost identical as those in the M/M/1 simulation, so we will skip them. There is only one difference though. Since there are no inport arrays, packets arriving at the MultiServer must contain an integral id to identify the source (and the FIFO queue) from which they are coming from. This also explains why inport arrays are not essential: a single inport can act as an inport array if we can find a way to distinguish different sources, based on either one of the arguments or some special field contained in the data being passed. There are several differences between a MultiServer and a simple Server. First, the outport are declared as an array, so an outport array is actually a collection of almost identical outports, except each of which is assigned a unique index. Second, we must allocate enough memory for holding multiple packets being serviced. Since the number of included sub-servers is controlled by the parameter n_servers, which can only be determined after the component instance has been created, we must allocate the required space right before simulation within the Start() function, and, correspondingly, destroy it when simulation ends within the Stop() function. As mentioned before, the inport in is actually connected to multiple outports from different FIFO queues. So to determined from which the incoming packet arrive, MultiServer must look at the field index, which contains the id of the Source component on which the packet was created. Notice the declaration of the timer wait. It is a MultiTimer, which is a timer that can, unlike the simple timer used in the M/M/1 simulation, schedule multiple events. Please refer to the manual for more details. Now we need a Setup function. Remeber the name of this function becomes merely conventional in COST/CompC++, so you can use any other name. In this function we must allocate enough space for holding packets according to the value of the parameter size. SetSize() is a predefined function for outport arrays which must be called before they can ever be used. The field index in the packet is very important. This index is used to tag the event scheduled. We can think of a timer as a timerarray in which each imaginary timer is identified by a unique index. Once a departure event is activated, the index of that event is returned as the second argument. source, fifo, and sink are now defined as component arrays. We must always first set the size of the component arrays, by calling there predefined SetSize() functions. We then assign values to the parameters of every component in each component array (we cann't do it at once). Running the simulation is no different.